Copper Ore Discovered Near “Deadman’s Lake” in 1898. Work was done on the lower claims of what is now the Silverado property, and rich float ores were found from year to year in the gulches draining from the glacier above, but the ore in place was not discovered in the high altitudes until 1919, when John Haahti located the first of the Silverado ledges, and several others some years later. Haahti had done considerable prospecting on the mountain without success and was at the point of abandoning the search when his attention was attracted to a goat. In endeavoring to get in range for a shot, he climbed over a high-grade ore outcrop, and immediately concluded to spare the goat’s life in exchange for the valuable discovery it had lead him to. The following year the claims were bonded by J. J. Coughlan, of Vancouver, and a company was formed and some ore was shipped. Some years later the Premiere company became interested and a large amount of development on other ore discoveries near the edge of the glacier, which the melting of the ice had exposed; but with the low price of silver, work was discontinued on the property, with the exception of shipping some 150 tons of high-grade ore by the leasers. Stevenson and Prowdfoot located additional claims on the Big Missouri Ridge, and in 1910 the combine groups of claims were bonded by Sir D. D. Mann, who, however did no work at that time; but some years later he reassumed the bond, did a large amount of open cut work on various ore showings, and, opened up considerable ore. Owing, it is understood, to the difficulties at that time to finance, the undertaking, the bond was allowed to lapse and shortly afterwards the property was bonded to the Trites, Woods, and Wilson interests and further work was done. But again the bond was allowed to lapse and the property reverted to the owners. 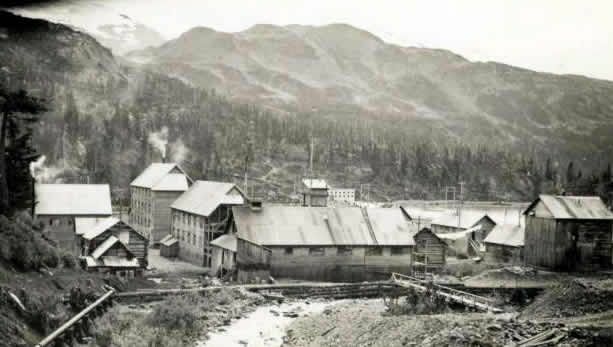 Later the property was bonded to Tacoma people, who formed the Big Missouri Mining C., and after carrying on development work, interested the Consolidated Mining and Smelter Co. The joint venture formed the Buena Vista Mining Co., by whom development is still proceeding.